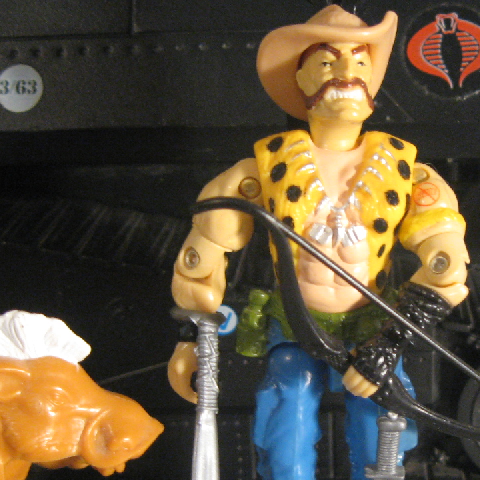 Notes: DiC's Gnawgahyde wore his 1989 outfit with a leopard-print brim on his hat and was portrayed as Australian. Alternately cast as comic relief himself or as a straight man to Metal-Head's antics. The warthog did not appear in the cartoon, although Road Pig has an unrelated warthog in the second season's Long Live Rock 'n Roll. Accessories: black PSG1 sniper rifle with long scope and thick bipod with legs set wide apart (new), silver knife with ribbed grip and serrated back edge (new), silver machete with double blade and arm clip (new), large black simple bow, curved at each end (new), light brown warthog with white mane, in crouching stance (new), tan outback hat with brim upturned on one side (new), black thin quiver backpack with engraved arrows (new). GNAWGAHYDE could have single-handedly decimated the herds of all the endangered species of Africa, if his fellow poachers hadn't railroaded him off the continent for cheating at cards, being generally obnoxious, and smelling bad. 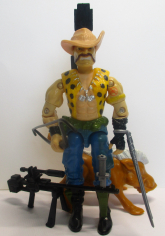 He was subsisting on his earnings as a freelance fur stealer when he was recruited by the Dreadnoks at an all-night donut and grape soda shoppe. "He takes his hunting and tracking very seriously! Gnawgahyde won't bathe for a month before he goes out into the bush so the animals will not smell the soap on his body. He greases himself with rancid hog-fat and eats what he can trap and shoot in the wild. Gnawgahyde does this so that the chemical additives of processed foods won't alter his body chemistry and scare off the game with too human a scent. It's a good thing he's basically anti-social!"